We decided it was about time to see whether the suggested cooking times of an item accurately represented when the food was properly cooked. A great example is a roast chicken, it is cooked regularly by many households however the risk of Salmonella from undercooked chicken often means that most roast chickens are in fact overcooked, resulting in a very dry joint of meat. So, we went to four different supermarkets and purchased one medium chicken from each one. This included; Tesco, Waitrose, Aldi and Sainsbury’s – some of the most popular supermarkets in the UK. We then noted down the cooking time suggested for each chicken and made sure that each one would be cooked exactly the same; at 190 °C, middle shelf of the same oven, in a small roasting tray, coated in a little bit of olive oil and seasoning and covered with foil until the last 20 minutes of the cook. They were also all taken out of the fridge 20 minutes before going into the oven, as per the label suggestions on each chicken. 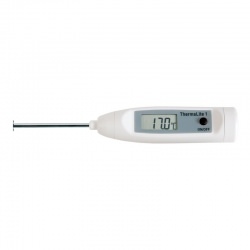 Before placing each chicken into the oven we inserted the temperature probe from our Digital Oven Thermometer (The DOT). 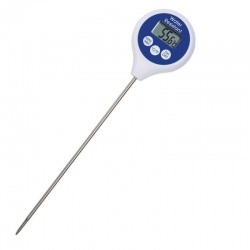 This handy little tool has a leave-in probe which means that you can continuously monitor the temperature of your cook, as well as setting a high temperature alarm. Simply insert the probe into your chicken (or other food), pop into the oven and then either sit the DOT unit on the counter using the kickstand or attach to the front of your oven using the magnetic pads on the reverse. You can then use the arrow buttons to set your temperature alarm (74°C for poultry). This alarm means that as soon as your DOT sounds you can confidently take your chicken out knowing that it is safely cooked, freeing up more space in the oven for all those other roast items, especially handy for Christmas Day! It’s also a top tool for the BBQ. 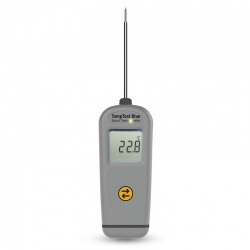 *Please note we are aware that supermarkets will slightly over estimate their timings to ensure food safety guidelines have been met however this is just to show that by using a DOT or Thermapen you can guarantee yourself a moist and delicious chicken while still being safe. The Aldi Medium Chicken was 1.65kg and had a suggested serving of 6 people. The label stated that the chicken should be cooked for 1 hr 45mins. The DOT alarm sounded at 74 °C with 32 minutes on the timer still left to go. Once the suggested time had been reached the internal temperature of the chicken was at 94 °C. The Sainsbury’s Medium Chicken was 1.6kg and had a suggested serving of 4 people. The label stated that the chicken should be cooked for 1hr 25mins. The DOT alarm sounded at 74 °C with 26 minutes on the timer still left to go. Once the suggested time had been reached the internal temperature of the chicken was at 98 °C. The Tesco Medium Chicken was 1.36kg and had a suggested serving of 4 people. The label stated that the chicken should be cooked for 1hr 25 mins. The DOT alarm sounded at 74 °C with 28 minutes on the timer still left to go. Once the suggested time had been reached the internal temperature of the chicken was at 90°C, this was the closest temperate to our recommended 74 °C. The Waitrose Medium Chicken was 1.5kg and had a suggested serving of 4 people. The label stated that the chicken should be cooked for 1hr 45 mins. The DOT alarm sounded at 74 °C with 45 minutes on the timer still left to go. Once the suggested time had been reached the internal temperature of the chicken was at 98 °C. This chicken was the driest when we sliced into it, measuring at nearly 100 °C meant the chicken was clearly very overcooked. *We find it very interesting how the Sainsbury’s chicken was 1.6kg with a suggested time of 1:25 while the Tesco chicken was only 1.36kg but also had a suggested time of 1hr 25 mins. You can clearly see from just this that supermarkets are not judging their time allocation correctly. However by using a thermometer we could have taken each chicken out safely while not overcooking it.